4. 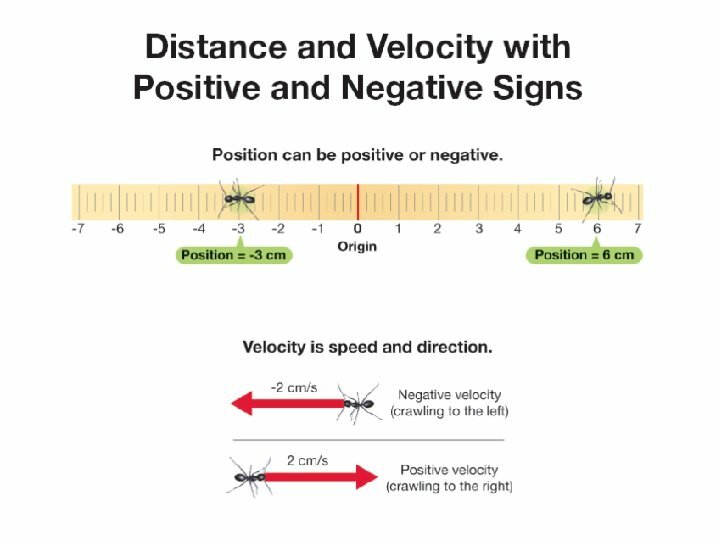 1 Position, Speed and Velocity ØPosition is a variable given relative to an origin. ØThe origin is the place where position equals 0. 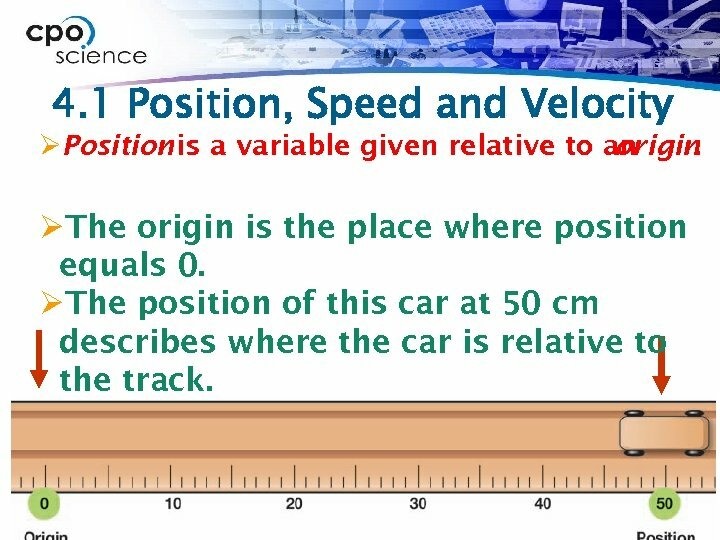 ØThe position of this car at 50 cm describes where the car is relative to the track. 4. 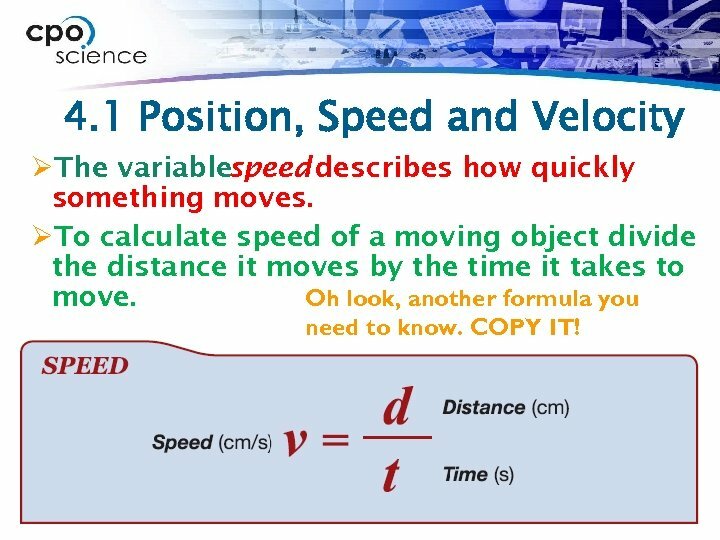 1 Position, Speed and Velocity ØThe variablespeed describes how quickly something moves. 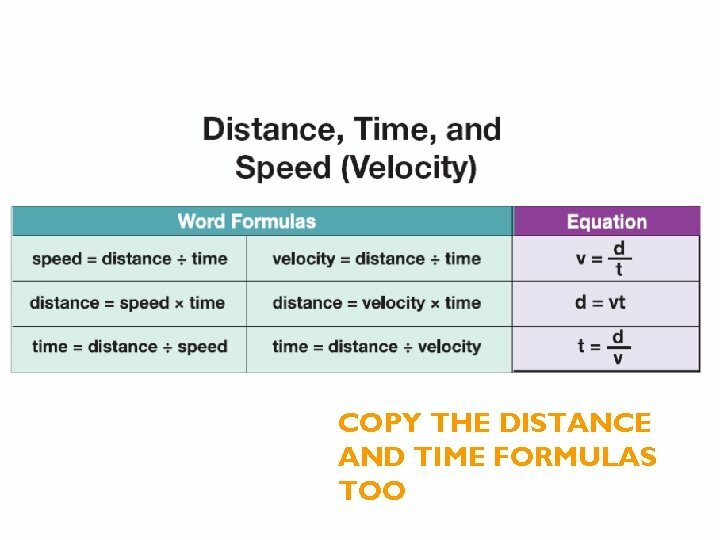 ØTo calculate speed of a moving object divide the distance it moves by the time it takes to Oh look, another formula you move. need to know. COPY IT! 4. 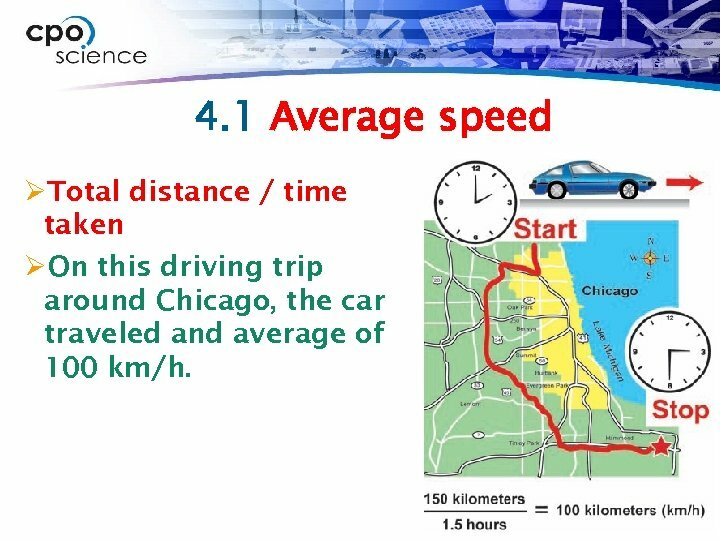 1 Average speed ØTotal distance / time taken ØOn this driving trip around Chicago, the car traveled and average of 100 km/h. 4. 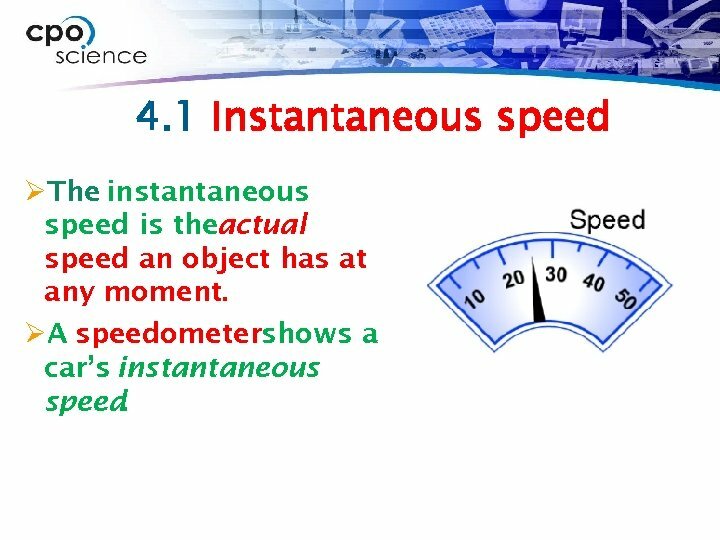 1 Instantaneous speed ØThe instantaneous speed is theactual speed an object has at any moment. 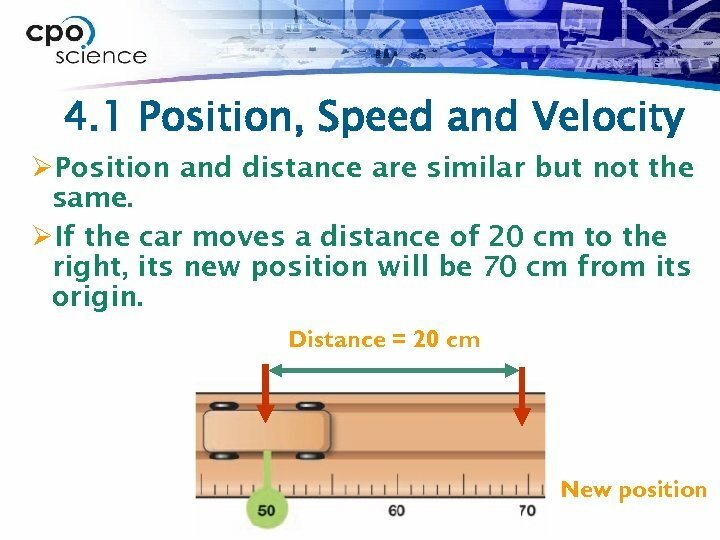 ØA speedometershows a car’s instantaneous speed. Your turn 1. You travel at an average speed of 20 km/h in a straig line to get to your grandmother’s house. It takes you hours to get to her house. How far away is her house from where you started? 2. 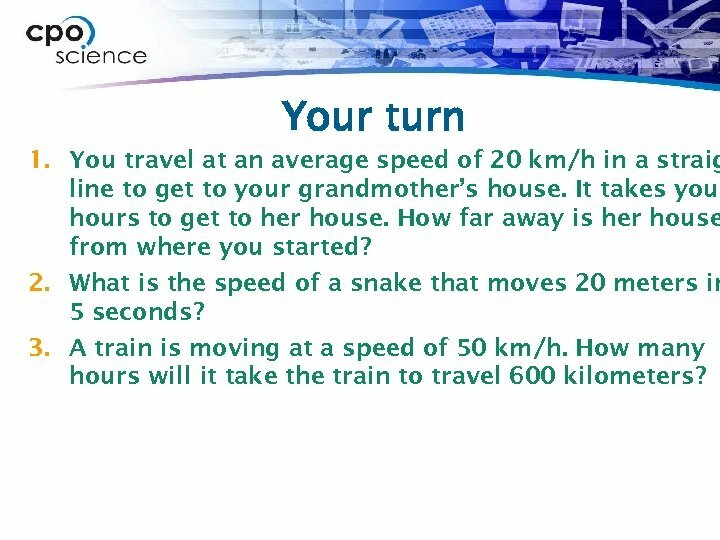 What is the speed of a snake that moves 20 meters in 5 seconds? 3. 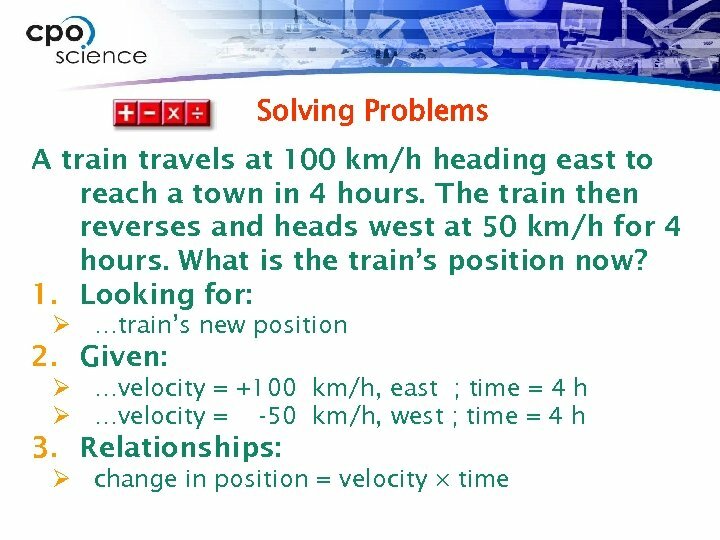 A train is moving at a speed of 50 km/h. How many hours will it take the train to travel 600 kilometers? 4. 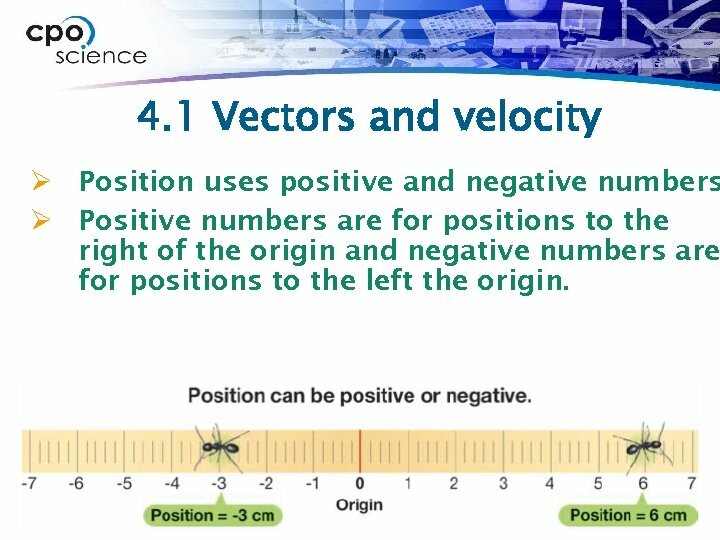 1 Vectors and velocity Ø Position uses positive and negative numbers Ø Positive numbers are for positions to the right of the origin and negative numbers are for positions to the left the origin. 4. 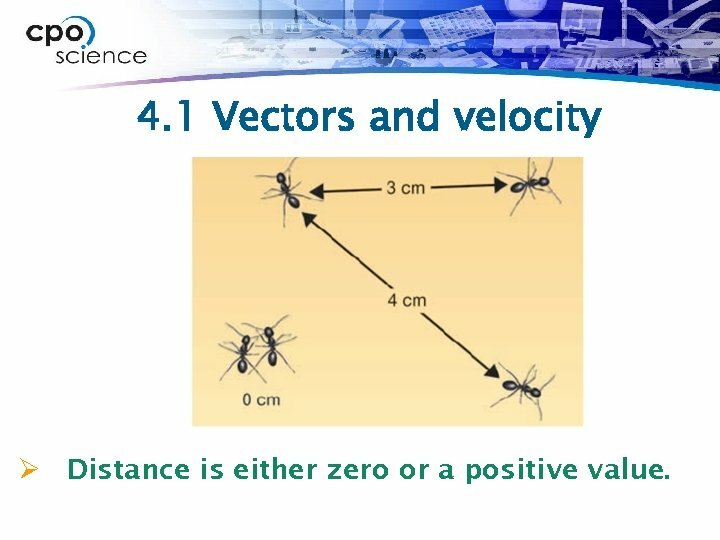 1 Vectors and velocity Ø Distance is either zero or a positive value. 4. 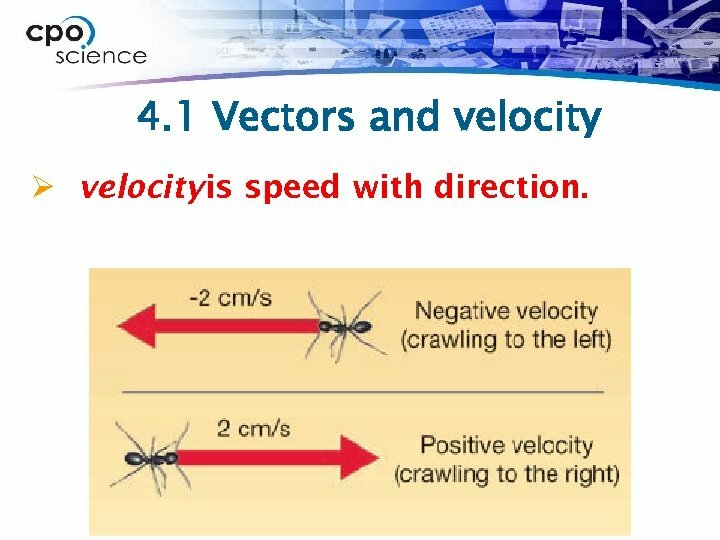 1 Vectors and velocity Ø velocity is speed with direction. 4. 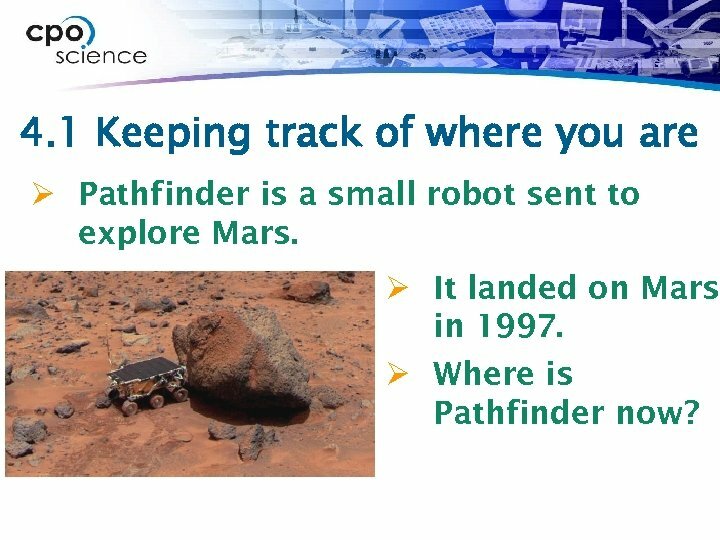 1 Keeping track of where you are Ø Pathfinder is a small robot sent to explore Mars. Ø It landed on Mars in 1997. Ø Where is Pathfinder now? 4. 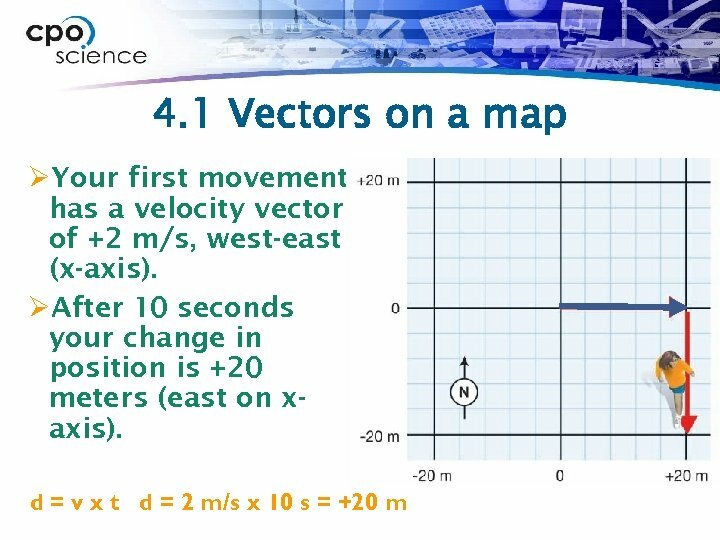 1 Keeping track of where you are Ø Pathfinder keeps track of its velocity vector and uses a clock. Ø Suppose Pathfinder moves forward at 0. 2 m/s for 10 seconds. 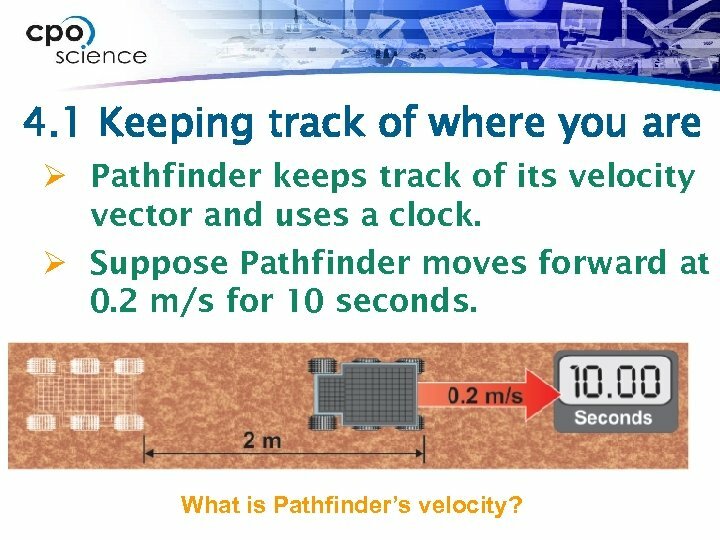 What is Pathfinder’s velocity? 4. 1 Keeping track of where you are Ø Suppose Pathfinder goes backward at 0. 2 m/s for 4 seconds. 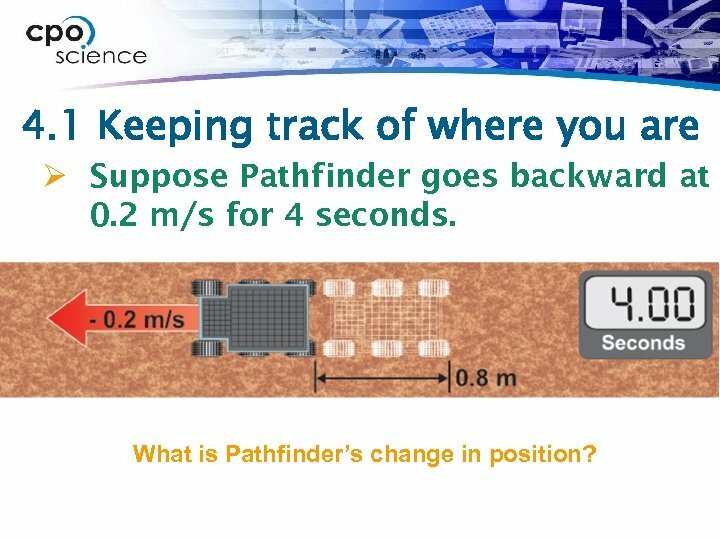 What is Pathfinder’s change in position? 4. 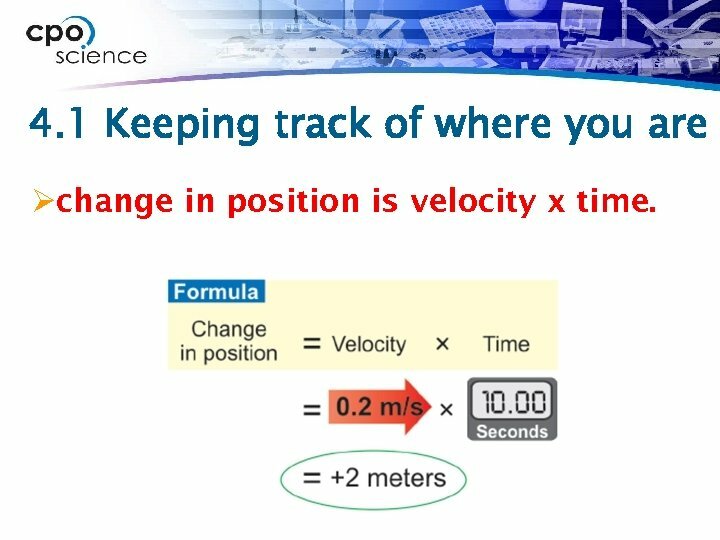 1 Keeping track of where you are Øchange in position is velocity x time. 4. 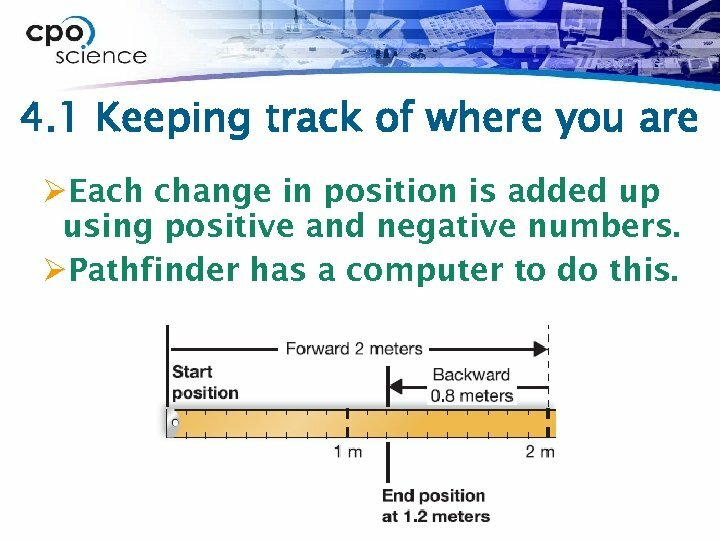 1 Keeping track of where you are ØEach change in position is added up using positive and negative numbers. ØPathfinder has a computer to do this. 4. 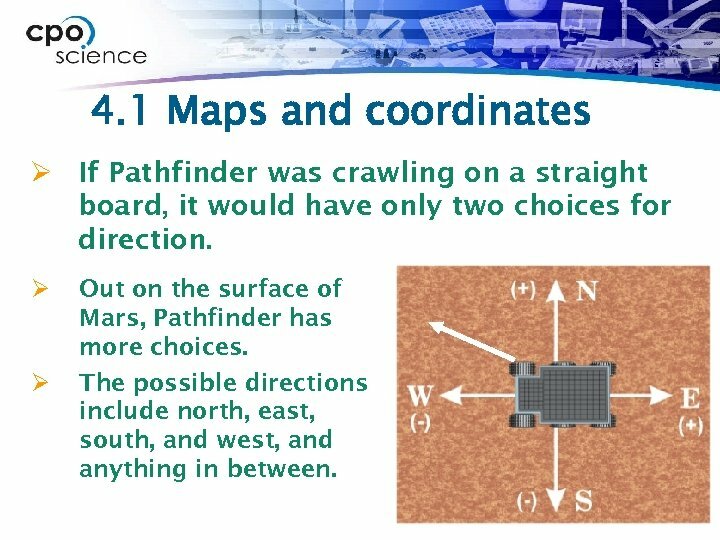 1 Maps and coordinates Ø If Pathfinder was crawling on a straight board, it would have only two choices for direction. Ø Ø Out on the surface of Mars, Pathfinder has more choices. The possible directions include north, east, south, and west, and anything in between. 4. 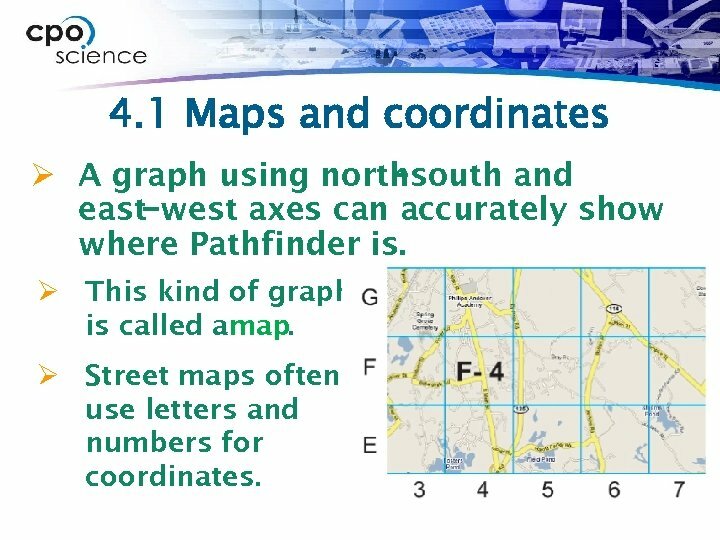 1 Maps and coordinates Ø A graph using northsouth and − east−west axes can accurately show where Pathfinder is. 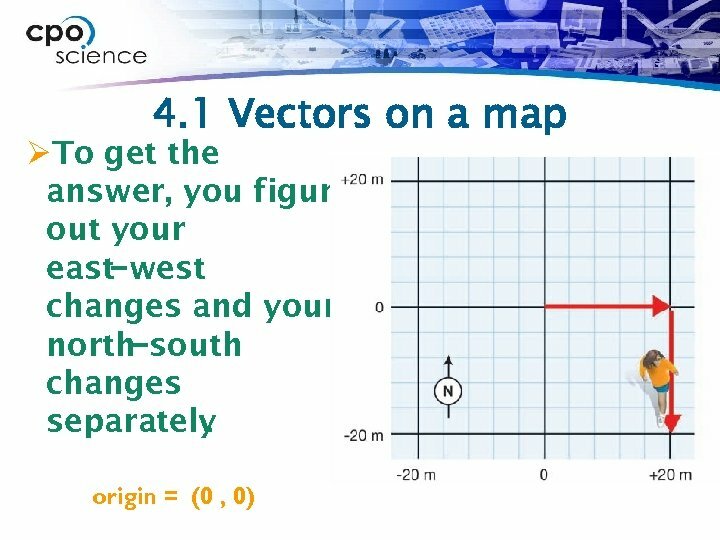 Ø This kind of graph is called amap. Ø Street maps often use letters and numbers for coordinates. 4. 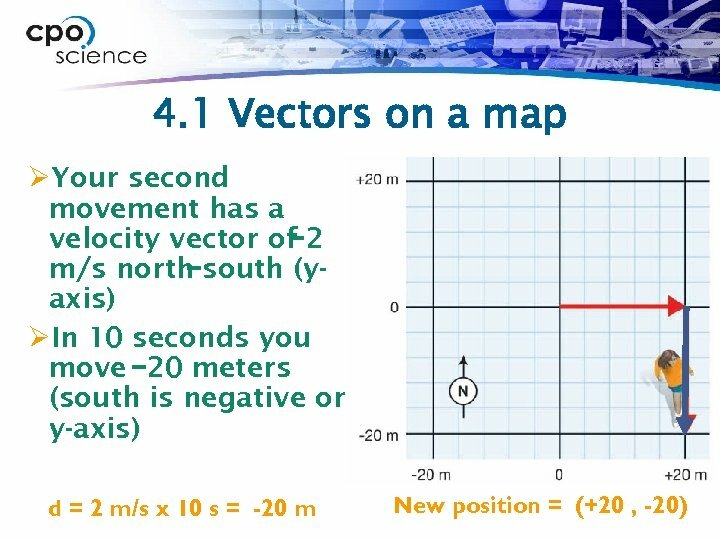 1 Vectors on a map Ø Suppose you run east for 10 seconds at a speed of 2 m/s. Ø Then you turn and run south at the same speed for 10 more seconds. Ø Where are you compared to where you started? 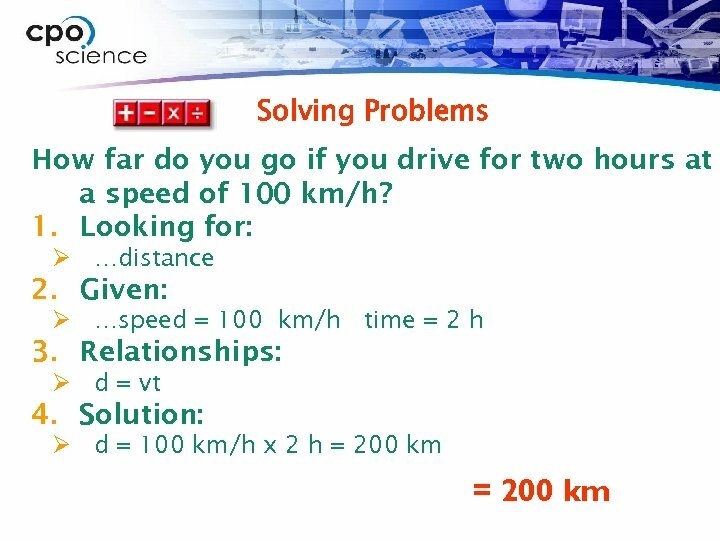 Solving Problems 4. 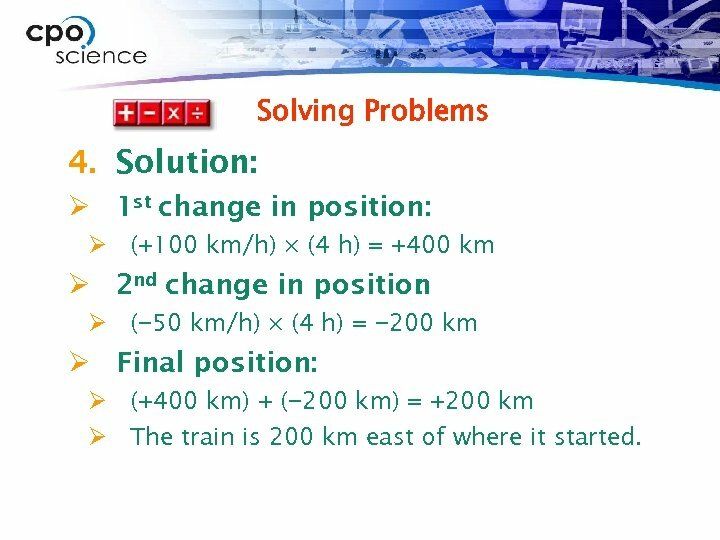 Solution: Ø 1 st change in position: Ø (+100 km/h) × (4 h) = +400 km Ø 2 nd change in position : Ø (− 50 km/h) × (4 h) = − 200 km Ø Final position: Ø (+400 km) + (− 200 km) = +200 km Ø The train is 200 km east of where it started. Your Turn 1. You are walking around your town. 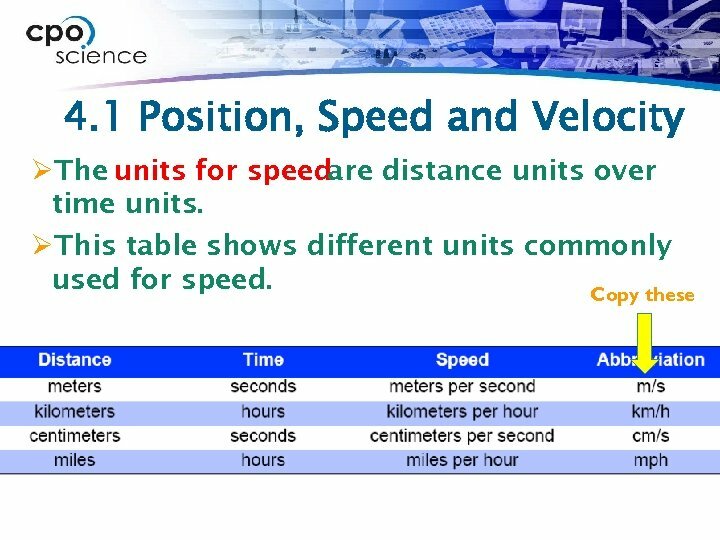 First you walk no from your starting position and walk for 2 hours at 1 km/h. 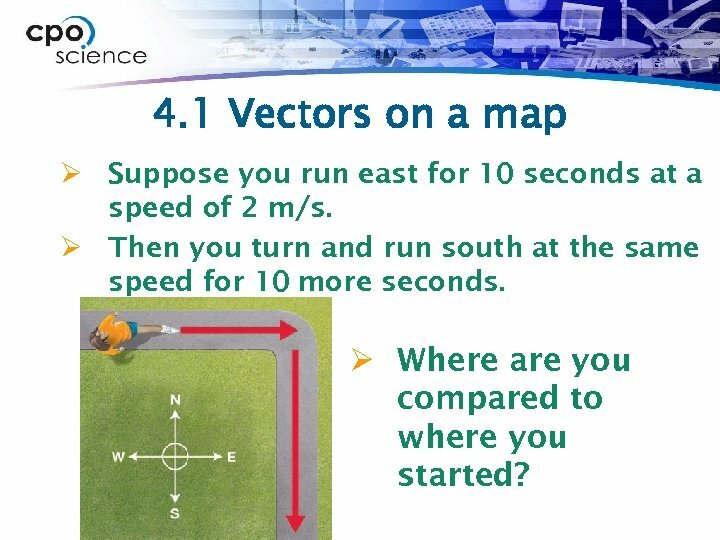 Then, you walk west for 1 hour at 1 km/h. Finally, you walk south for 1 hour at 2 km/h. What is your new position relative to your starting place? 2. A ship needs to sail to an island that is 1, 000 km sou of where the ship starts. 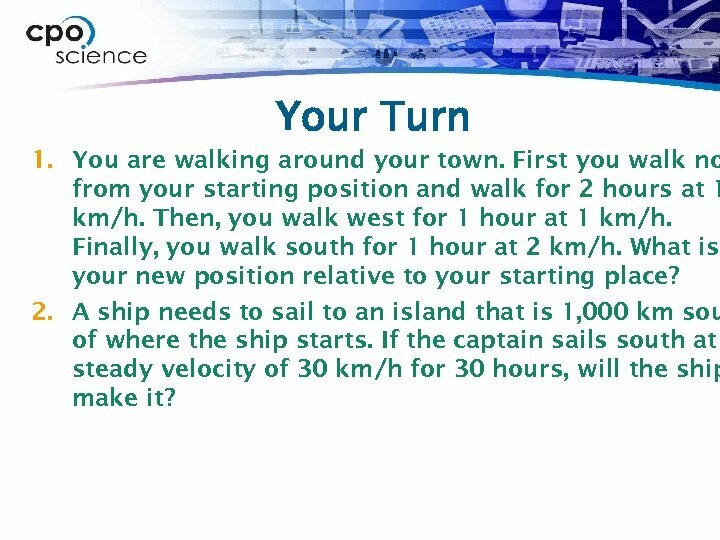 If the captain sails south at steady velocity of 30 km/h for 30 hours, will the ship make it?